As I travel the world I get to meet the best of the best tackle tarts. 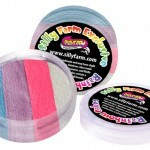 Tackle tarts are paint hoarders that must have and buy everything related to face painting. I love tackle tarts because they keep Silly Farm in business, however I hate to see things go to waste. Some of you have so much paint that you couldn’t use it in two lifetimes. Then I meet painters that have a hodge podge of this and that, and they are still trying to find the perfect kit and set up. The perfect kit does not exist, nor does the perfect brand. You will have to kiss a few paint frogs in order to find the products that transform your art into a Picasso or you can read my list of 20 Must haves for painters and hopefully I can save you money and time kissing those frogs! 20) A mesh laundry bag to hold sponges. Sponges are lightweight, fly away and are easily lost. I store my sponges in a laundry bag so they don’t fly away and it makes it simple to wash them after a gig. 19) Baby Wipes and not the cheapy ones either! When buying baby wipes try to make sure they don’t have a lot of fragrance or are rough on the skin. That way you protect your paints and don’t leave fibers in them. You can also clean the children or your hands without smelling like a baby booty. 18) Business Cards on your table! If your goal is to generate more business and solicit new clients, don’t make them do the work. Have your cards and your contact info readily available so they can find you, book you and PAY you. A GOOD mirror too! Would you buy an invisible Mercedes? Probably not, so why would you paint a masterpiece and not be able to show it off? 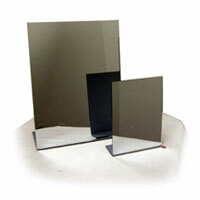 Look for an acrylic mirror at least the size of a sheet of paper. You want your clients to look in the mirror and go WOW, not scramble for a lip gloss mirror at the bottom of their mom’s purse. The reason I mention an acrylic mirror is to avoid 7 years of bad luck as acrylic mirrors are less fragile and clean easier. I have saved the lives of paper cut wounded children and was praised as a hero just because I carry bandaids with me. You would be surprised how far a bandaid can go and how you can save the party. 15) A Gallon of Water. In order to keep my set up looking clean and keep parents happy with my hygiene practices, I dump my dirty water quite often. To avoid running to the sink every time I need a fresh cup, I carry a gallon of water with me to ensure enough clean water for the entire length of my gig. Clean is the new cool! 14) A Table and Chair. It wasn’t until I stepped into the role of party mom that I realized how crazy you are when you are hosting a birthday party for your kid. You want everything to be perfect and you want the least amount of problems thrown your way. When I hire a professional and pay professional rates I expect them to come ready to go, and I expect that they have a table and chair to do their job. A table and chair is part of the required materials in order to complete their duties. The last thing I want to do when I am hosting a party is stop greeting my guests to find a table for the face painter. Being prepared is essential and gives you a professional look. If you want to charge like a professional you need to look like one. I carry my face painting kit, my purse, my gallon of water and other stuff to my job. When I set up I store everything under my table and cover it all up with a nice glittery table cloth. My clients like it because I look professional and I love it because it hides all the things I don’t want kids to touch or mess with. A smile is the only curve that sets everything straight. Remember, we sell smiles. If you yourself aren’t wearing one, how do you expect your clients to feel? Put your bad day aside when you are on the job and remember to smile because its contagious! 11) Water Bottle, Snacks, and Gum. Especially for those long gigs! I have painted at events for 6+ hours and thank goodness I always pack a little something to nibble on and drink during the event. While it feels inhumane to paint on your feet for 6+ hours, sometimes we get carried away. Having a little snack in your pocket can make a huge difference. I try to keep granola bars or raisins in my pocket to help me along the way and keep myself energized. I also bring some water for me to drink on the job so that I don’t have to rely on the host of the party to offer me a drink. Especially during the summer months! I LOVE LOVE LOVE my brush tub. I have always had trouble losing my brushes, or them rolling around on my table. 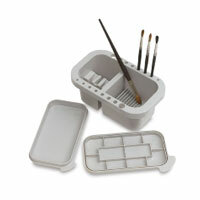 I love this brush tub because I can stand my brushes up in the right direction and it has 3 compartments. I always keep one compartment with clean water to use with my q-tips for the lips. The other compartment has ridges at the bottom that help me clean excess paint residue from my brushes. It’s a good size to travel with and easy to clean! The best way to apply lipstick is by using a q-tip. This way you don’t have to use your brush on everyone’s lips and you can keep your brushes more sanitary. A little hint to get the glitter to stay longer on the lips. Add a little Vaseline over the lipstick and then dab glitter on. Your model will have glittery lips for a while. By now most of you know I am a Gold Grip fan. The Gold Grip brushes are my personal favorites because they hold their point after repeated use in water and the bristles are chiseled to a fine point. The hairs rarely start going awry unless you leave them immersed in water, and they hold paint nicely. Round brushes are the most commonly used brushes by face painters and having a few GREAT rounds in your kit will make a HUGE difference in your line quality. 7) An assortment of Arty and Rainbow Cakes. Even if you just buy one arty and one rainbow cake it will be worth the investment. You would be surprised how much faster you can paint when you can put down five background colors at once. My new personal favorite rainbow cake is the Hippie and Moon Dance Rainbow Cake. They are WOW! I also can’t live without my Bright Leaf and Juicy Fruit Arty Cakes. 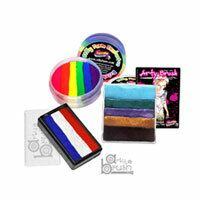 Rainbow and Arty cakes are impressive to have on your table because parents look at your supplies and think you have a secret product only available to painters. They are also amazed at what it does and really are blown away. I load my table with rainbow and arty cakes because it also shows the parents that I have products they can’t just buy at WalMart or Party City. 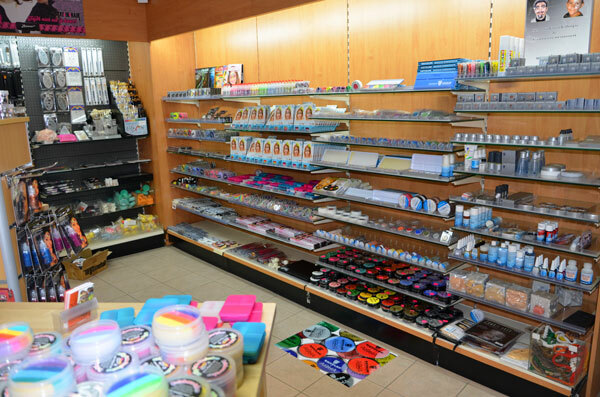 The products I am using are sold at the super exclusive, Painters Paradise, Silly Farm Supplies. Only painters can shop there (Just kidding). 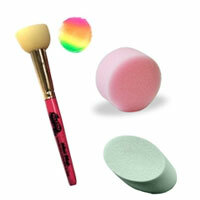 In order to apply base coat or to cover a large area, you will want to use face painting sponges. I suggest keeping them in the mesh bag mentioned earlier so you don’t loose them. Cutting them in half is another great way to extend their life and get the most out of them. This way you will also have a nice flat surface to blend with and cover a large area. If you plan on buying sponges from a craft store, make sure they; are soft to the skin, don’t fall apart when used in water, and don’t itch the skin. Nothing finishes a face painting design quite like some sparkle. While some people see glitter as the STD of the craft world, I see it as essential as a Visa card. Never leave home without it! If you have to choose just one glitter, I would suggest the White Fairy Dust. The white fairy dust is the most practical because it can go over any color without covering the design. If you want to get fancy then I suggest having a pink, gold, and lime green glitter too to dress up your lips, leaves and tigers. If you purchase your glitter from a craft store please make sure it is safe to use on the skin. 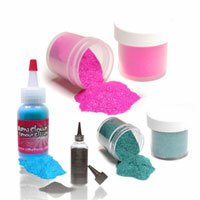 Make sure it is a cosmetic grade glitter, made from polyester not metallic. 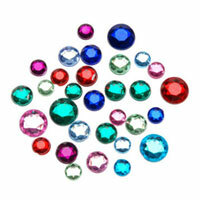 Metallic glitter can be harmful in the eyes and cause the child to feel itchy. It took me 4 years to work with a chemist to come up with a formula that was non toxic, safe for the skin, organic and that can be used while we face paint. 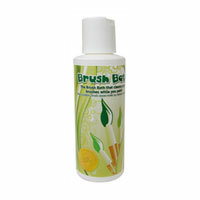 Brush bath is a water sanitizer and brush conditioner. You can use it while you face paint to keep your water fresh in between rinses, and it also conditions the bristles while you rinse. It does not contain any alcohol and it is 100% safe on the skin. Adding rubbing alcohol to your face painting water does not have any affect or serve a purpose. If you don’t use Brush bath, I recommend using baby shampoo, but only a very little. 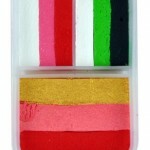 Powders can be just as useful and time saving as using rainbow cakes. 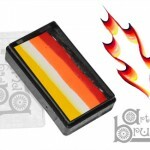 The powders serve as a fast background color without having to use a damp sponge. 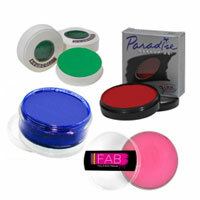 Powders are applied dry with a smoothie blender which allow for fast and smooth application. I love using the red starblend for Spiderman, it has saved me so much in paint and time! Gems are like my secret weapon. When a child doesn’t want to get painted, I whip out my gems and make a child’s day! Gems can be used to create a necklace, crown, or a pretty bracelet. Its funny, but something as simple as a gem can leave a lasting memory with both the child and parent. They are inexpensive, but can take your face painting to the next level. 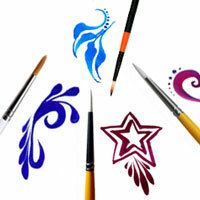 1) Professional Grade Face Paint. A painter cannot paint without paint. It’s a must. I’m not going to sell you on any one brand, I would rather just push you in the direction of using skin safe, cosmetic grade face and body make up. Avoid acrylics, avoid grease make up that is hard to remove for kids, and set yourself up with a kit that looks professional, allows you to paint like Van Gough, and that you are proud to use on your own skin. Keep your paints clean, build a kit around the colors and designs you like to paint the most, and mix and match your favorite brands. I promise you will love your kit when it becomes a reflection of you. If I missed anything on my list, send us an email or leave a comment below! Happy Painting ! 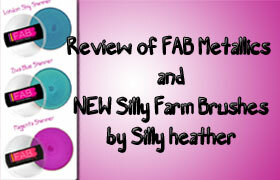 A product review by Silly Heather, covering the brand new Silly Farm Signature Brush Line and FAB Makeup Paints. Silly Heather demos the products and talks their pros and cons. Watch the FAB Metallics & New Brush Review on Youtube.